Lakeshore Lodge is located on White Cross Bay at Pony Meadows 21. This is a prestige 3 bedroom self-catering lodge with outside hot tub and lake view. 2 dogs accepted at this lodge. We had a wonderful week at Lakeshore Lodge. The lodge is lovely, spacious, well equipped, and in a great location away from the busy bar / check-in area with a beautiful view across Lake Windermere. We went with 2 friends and their dog. The lodge was plenty big enough for all of us, and the hot tub was a lovely and not overlooked. Would highly recommend. The lodge was lovely and the view was wonderful. The hot tub outside was easy to use and lovely to relax in. Windermere lake cruise is very good. There is also a brillant chocolate shop in the Ambleside high street called the Old Toll House which i would highly recommend. From booking our stay at Lakeshore Lodge I knew it was going to be pretty special and when we arrived I could not believe how close we were to the lake and to be able to see the beyond perfect views from the cabin. The cabin itself was clean, spacious and modern and was definitley a 5 star log cabin. The park was lovely and reception was very helpful when arriving at the park, you could easily walk from the cabin to the reception/bar which was handy. We will definitely be booking again in the future and even though we properly had the best weather possible for February we could imagine sitting on the decking in summer and taking in the spectacular views. The hot tub was wonderful so relaxing and was maintained daily during our stay. Thank you for a fantastic break. All we can say is "WOW" absolutely loved it, would highly recommend to anyone. Perfect location and the Lodge it's self was stunning. Lovely to wake up with views of the lake, and even better to come back to on a night time after aday on the hills, to relax in the hot tub. Had an amazing stay thank you. Loughrigg cragg. The mortal man. The drunken duck. We stayed as a family of 6 including 2 teenage girls and this was our 2nd visit to whitecross bay park which we just love. The lodge was kept to a very high standard and was modern inside and out. The bedrooms were sufficient for a short stay away and have to say we all thought beds were comfortable and the shower was amazing. The girls aged 15 slept in the bunk beds which to be honest they did not mind. No storage in that room but they didn't bother. Hot tub was great and very well maintained and also checked a couple of times during our stay. The lodge has a beautiful view of the lake which we loved looking at day to day. The park itself is very well kept and the restaurant was just a few minutes walk from our lodge. What can we say about that restaurant.. as well as it being the school holidays and absolutely mobbed, the staff were great so friendly and nothing was a bother for them. We ate there every night and the food was delicious, not one of us had a complaint about what we ate and every night we all tried something different. Compliments to the chef! Very high standard of food served. Only small niggle is dogs can't get in but didn't spoil anything for us. 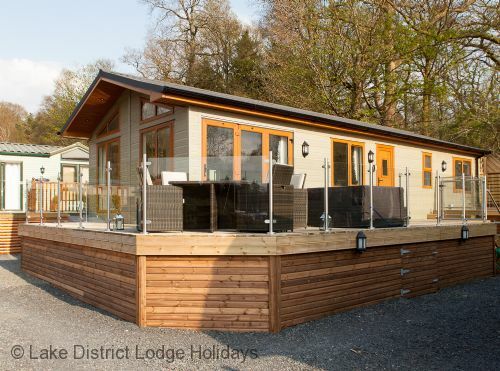 The lodge is positioned in an enviable location near the shore of Lake Windermere. It is spacious well equipped and comfortable. The hot tub is an added bonus! Being able to be together as a family on my Son's birthday. The Thai restaurant in Bowness. First time staying in this lodge - Superb location as lake could be viewed from decking and inside lodge - beautiful. Lodge was gorgeous and very well thought through as everything you could possibly require was to hand and even some things I would never have thought about, great care had been taken when customer requirements had been assessed. We will definitely be returning to this lodge - thank you. had an amazing weekend lovely weather and the views were amazing. The lodge was idealy situated the hot tub was amazing. White cross bay the best place to be . Stayed here for the second time. Lovely lodge in a great location. Parking next to the lodge can be a bit of a squeeze. Lodge is a really good standard. Easy booking process, quick and responsive follow up. Just wish the park had an enclosed dog exercise area and that the eating area would be dog friendly. Lovely view, inside of lodge clean and nice design. Outside felt dirty due to poor decking area especially around hot tub, outside furniture very dirty, we needed to give it a good clean, bbq slab is 2 broken breeze blocks. The view and lodge situation was fantastic. Thank you for your review, Peter. We note all you have said and whilst pleased you enjoyed the lodge, and indeed the lake view, we apologise that the outside space was not to your satisfaction. We have addressed your feedback comments and can confirm the outside area has been spruced up as well as the outside furniture professionally cleaned. Please accept our apologies that it was overlooked for the duration of your stay. We are confident that should you choose to return to this prestigious lodge everything will be to your satisfaction. Lakeshore Lodge is a beautifully designed three-bedroom holiday lodge with hot tub and lake views. What an amazing view to wake up to every morning. Fabulous lodge, gorgeous view. Very well equipped. Modern and clean. Can not fault the lodge. Thank you for your comments, Lisa and we are delighted to hear you enjoyed your stay. Indeed a fabulous lodge and a gorgeous lake view - Perfect! We look forward to having you stay again in the near future. Lovely comfortable lodge. Great view from the deck and lounge of the lodge of the lake. Lots of wild life and very peaceful quiet winter break. Great for visiting Windermere and Bowness along with Ambleside. Would certainly book again. Just relax on the deck overlooking Lake Windermere, pure pleasure. Gorgeous cabin. Loved the jacuzzi. Spotless. Modern and very comfortable. Great communication up to arriving. (Not a complaint!) however, we found it highly amusing that we had every requirement needed in the cabin, until we needed a cork screw! My husband searched for a neighbor to borrow one. It was the only thing I didn't bring thinking we would have one. That was funny. We had a lovely time and as I said the cabin was fantastic, I just found it quite expensive for a two night stay being nearly £500. Not so secluded and the facilities are not worth that, but bare in mind d you're paying for location. Thank you for your review, Dana. We were delighted to hear you enjoyed your stay at this amazing lodge. Lakeshore is indeed gorgeous. Beautifully presented, stylish and very comfortable. Add in the hot tub and magnificent lake views for a relaxing and restful stay. Having said that, thank you for letting us know the lodge was missing a cork screw, this was very quickly addressed and our apologies for the inconvenience it must have caused. Whilst we note your suggestion to allow guests in the members bar this something outside of our control as booking agents, although we have passed it on to the Park management for their consideration. Pedro’s is a super alternative, delicious food and good atmosphere. This three bedroom holiday lodge is ideal for families, or friends, and perfect for an unforgettable holiday in the Lakes. We shall be very pleased to welcome you again in the near future. The Park was in good place, handy for Bowness. Club house was ok for bar meal etc. Shop could do with staying open a bit longer on an evening but perhaps because it was February it didn’t feel the need. Overall all good. Great location. Spotless inside. Amazing facilities. No direct Wi-Fi meaning it's not ideal for online streaming but that's ok because it makes you get up off the couch and enjoy the surrounds. Hot tub amazing. Views spectacular. Thank you for leaving a review, Stuart and letting us know you had an enjoyable stay. Lakeshore Lodge is in a super location overlooking the lake and with far reaching views, simply stunning. A welcoming retreat after a day out exploring. Lake views, and a beautifully designed and fully equipped lodge with hot tub. Can it get any better? We are delighted you would recommend to others, thank you. We have just stayed in lakeside lodge 4 adults two children aged 3 and 4 and two boxer dogs! Absolutely lovely spacious modern lodge with beautiful views of the lake! Tv in every room which helped when the girls wanted to get up early and watch kids tv in bed haha! The tv in the master room may i suggest bring lower down onto a bracket in the corner above the locked cupboard as you can't even see the screen lay down! We booked purely for a chill out as i am 7 months pregnant so wasnt up to going on the long walks we previously did last time! Hot tub was amazing and the kids loved it too! Only small complaint was we only had half a roll of toilet roll in the main bathroom and ran out after a day...i understand you have to buy your own stuff but surely toilet roll could be included in the price you pay! But im not one to rant on about that it didn't spoil our stay and we are itching to book again and return next year! 5 star! Thank you! Fabulous View ! One of the best on site. This lodge is located in a quiet area with one of the best views on site from the lounge & the outer deck. You are paying a premium for the location rather than the lodge itself, you can get larger lodges on site for less however we wanted the view ideally. No real bad points - that said we have a large 4x4 and parking is tight, you need to reverse into the space in order to make the return to exit ( This is no bad thing, and you can get 2 normal size cars on the parking area if required ). No mention is made of this on the overview - just to re-iterate though this didn't bother me. On arrival we were greeted with an eye watering smell of air fresheners, again this wasn't a problem as we put all 4 of them outside, which calmed things down a lot. Again this was not a problem, and we placed them all back inside upon checkout ( Apologies, but I have an allergy to anything like that ). The only actual complaint I would have made if I was that way inclined, was that the hot tub was serviced during our stay - the pair of engineers ( if you can call then that, made no attempt to advise us they were there - and when my wife is breast feeding I don't expect men happily helping themselves to a window view unannounced. Without being too graphic, anything could have been occurring. To add insult to injury, they emptied the hot tub and disappeared unannounced........................ So had we planned a dip we would have been coming up short on expectations ! 5 Hours later they returned unannounced to fill the hot tub..... slowly ) This is not a complaint about the lodge itself, as the hot tub is great and let that be clear here. The Lakeland Spa company ought to learn some manners, common courtesy & customer service would not go amiss. The name Lakeshore Lodge is a little misrepresentative in that the lodge is not on the lakeshore, though the photos would have you believe it is. Its not far from, however there are 2 further lodges to the left that are sited closer to the shore than this one. This is not a complaint, I am merely advising anyone considering this lodge not to be disappointed etc. I have been visiting the site for 35 years and I knew this prior, however anybody that is new to the site may not fully appreciate the plan and may base their assumptions on photos alone. All things considered, we had a fabulous break and the amenities in the lodge were as expected in comparison to other lodges we have stayed in. Would we stay in this lodge again ? Probably ( Arguably the best to rent on site ). Drive from Grasmere to Keswick - the views of Thirlmere are jaw dropping ! Lovely location for this lodge. Views over the lake. Lodge well kitted out with everything you could need. For a meal Pedro's. Very welcoming and able to take the dog with us. Love White Cross Bay and have holidayed here for many years. This was our first stay in Lakeshore lodge as we needed a dog friendly lodge this time. The location in the Pony Meadow area of the park was just fabulous. I could sit and watch the stunning view of the lake and hills all day! The lodge had everything we needed and the hot tub was a lovely way to relax at the end of a long days walking. The view and we were lucky to have good weather. Beautiful location close to the lake, this was an excellent base for what we needed. Close to all the amenities we had booked to do e.g. Go Ape, Fishing on Derwent Water and the local villages. Accommodation is brilliant, and a dip in the hot tub at the end of the day was bliss. Thank you for taking time to review your stay, Beth. Your comments are very important to us and although we were pleased to hear you had an enjoyable stay, it appears there were a few things not quite to your satisfaction when you arrived. Rightly so, you contacted us at the time and we were pleased to address these things for you. We are unsure why the clips on the hot tub were not attached. With reference to the gate, this is of a bespoke design and a temporary fix is in place until we find a solution. We understand your concern as a responsible carer and we apologise for the inconvenience and worry these things caused you. We were sorry to hear the park services ie reception and onsite pool were not as expected, although as booking agents this is something outside of our control. Having said that we have passed on your feedback comments to the park management for their future reference and trust they will look in to these. Thank you for letting us know you enjoyed Choices Health Club, a super alternative and complimentary for all our guests. Lakeshore Lodge has amazing lake views and is beautifully designed and equipped for a relaxing and comfortable stay. We apologise once more that on this occasion your stay did not start off as expected although we are confident that should you choose to return in the near future you will find everything to your satisfaction. A beautiful location and luxury accommodation, where better to be? Lodge was more than we could have expected. Our stay was very enjoyable and the views from the lodge were fab. Very relaxing and brilliant family time spent! Thank you for your review and we were delighted to hear you enjoyed your stay at Lakeshore Lodge. It enjoys a truly lovely spot with fabulous lake views and is hugely popular with our guests (not forgetting the private hot tub of course!). We visited the area for a wedding with our small children, dogs and our friends. The lodge was the perfect size for all of us and having the hot tub was a bonus. The location was quiet and peaceful with the most amazing view. The park is lovely for families and so close to Windermere and all the lake activities/sights. The lodge is situated by the lake. It is well equipped and spotlessly clean. Added bonus for us is it is dog friendly. Highly recommended. White cross bay itself is clean and has a range of amenities. I would consider it dog 'tolerant' rather than dog friendly. No enclosed area to let dogs off lead and dogs not allowed in the bar etc., unlike neighbouring resorts (much better equipped and dog friendly). Size and cleanliness of lodge, also location. Thank you for reviewing your stay at Lakeshore Lodge, Andrea. We were so pleased to hear it was to your satisfaction. Indeed a beautiful lodge, very comfortable and well equipped accommodation for guests to relax and unwind. The perfect holiday for those looking for a luxury pad with a hot tub in the lake district – and with amazing views of Lake Windermere. We note your comments about the Park and although it does not allow dogs in the bar area there are many bars and restaurants in the local towns and villages that are very dog friendly. Having said that, thank you for your comments and we have passed them on to the Park Management for their information. A drive to Keswick is a wonderful day out, beautiful scenery all the way and a delightful town to explore - and such a lovely lodge to return to at the end of the day. Very kind of you to highly recommend lakeshore lodge and we look forward to welcoming you again in the near future. Very well positioned lodge right by the lake, location is a short drive from the towns. On site shop is stocked more than adequately and the lodge itself is in great shape. Fully functioning kitchen, hot tub, master bedroom with on-suite bath/shower and even Sky TV. Pleasantly surprised and will hopefully look to book again. We played local footgolf a short drive away, picked leaflet up from reception, great fun and a brilliant course! Jacuzzi was great sitting in there whilst being hailstoned on. Had an amazing time staying in this lodge.. excellent view of the lake and bonus was the hot tub.. couldn't get my 8yr old daughter out of it..
Lodge was very clean on arrival and had everything you needed for your stay.. The restaurant and bar was excellent with great food and service and was reasonably priced.. Swimming pool and sauna was good.. only down side was it was busy and had to put our name on a waiting list.. waited about 20 mins.. Thank you for the great review, Rachael. It is a pleasure to hear you enjoyed a weekend at Lakeshore lodge. A lovely treat for a 40th birthday, a stunning lodge with amazing views of the Lake. It is designed with quality and offers guests first class accommodation with of course a hot tub – Lovely to hear your daughter enjoyed it. An alternative option to the onsite pool and for future reference, all guests of LDLH have complimentary use of Choices Health Club – very convenient to the Park and has a fabulous pool, jacuzzi, steam room and gym complex. We are sure your daughter would love it! We are so pleased to hear you all enjoyed your stay in one of our luxury lodges and would be delighted to welcome you again in the near future. Perhaps for another birthday treat? Had a lovely stay in the lodge with a gorgeous view. 4 adults, baby and 2 dogs visited Monday to Friday and had a lovely stay. The hot tub was gorgeous and we used it every day. Only snag was we hired a travel cot for our baby but the only space to put it up in the bedroom blocked the en suite so you couldn't use it. We took our moses basket in the end so just ended up using that instead. We didn't use any of the on site facilities as we took the dogs and you are not allowed to leave them unattended in the lodge. Overall we would definitely recommend the lodge. Walk from Rydal to Grasmere. Had a lovely meal in Teedies in Grasmere. Thank you for your review, Claire. We were pleased to hear that you all enjoyed your stay, and in such a beautiful lodge. Our apologies that the travel cot blocked the en-suite although on this occasion you resolved this by using the moses basket. As you are aware the bedrooms have limited space and are not really designed with travel cots in mind therefore a slight compromise has to be made and in this particular lodge the only place is by the entrance to the en-suite. Our apologies that this caused some inconvenience. That said the lodge has so many positives, it oozes luxury with three beautifully designed bedrooms, and views overlooking the lake – absolutely amazing to sit out and soak up. Not forgetting the private hot tub – ideal after a day out walking. Very kind of you to recommend this lodge to others, thank you. I stayed here from Friday to Monday and i had the most amazing weekend in this lodge! the location was excellent with amazing views and the lodge itself was in great condition! Everything you could need is provided! Great stay! Thank you for the great review, Katie. We were delighted to hear you had an amazing weekend. The lodge is designed and tastefully furnished to provide luxury accommodation with the added bonus of a hot tub. Not forgetting the magnificent views of Lake Windermere! The perfect holiday retreat. We look forward to welcoming you again in the near future. Windermere lake cruise, catch from Brockhole. Catch the 555 up to Grasmere. What can I say 4 adults 2 children and 3 dogs had an absolute delightful time, prime location on the lake side with relaxing atmosphere and stunning views weather helped but we would have loved it no matter what the weather was like. We will definitely return. Stayed with family and baby for a long weekend in August. Lodge was excellent with good facilities. Hot tub was perfect. Lovely view across the lake with only one cabin further forward next door. Although we didn't use it, the DVD built into the tv was not working but a replacement dvd player was set up before we arrived. The maintanence man had to be called when the key safe would not open so we could obtain the door key after a trip out. He arrived after our call within 10 minutes and duly opened the key safe to retrieve the key so we could enter. Excellent service in an emergency. Kitchen facilities were excellent although no baking tray was available. I am led to believe this is being addressed. There is plenty of bedroom wardrobe storage in the master and 2nd bedroom. 3rd bedroom has bunk beds. Walking space is tight in the 2nd bedroom but the bed is comfortable. Close proximity to Bowness and Ambleside. Thank you very much for the review and for your kind comments, David. We were so pleased to hear you had a lovely stay at the lodge and also took advantage of its great location to the many pretty towns and attractions nearby. Hill Top is a super choice for a magical day, beautifully preserved to enchant children or adults of all ages. And where better to return than Lakeshore Lodge, tastefully designed luxury accommodation with remarkable views of Lake Windermere, and an added bonus of a hot tub - Very relaxing treat after a full day exploring the Lakes. Delighted to hear we resolved the issue promptly for you - thank you for your patience. We look forward to welcoming you again in the near future. Before booking we were sceptical on the quality and location of the lodge especially as it was dog friendly. The lodge and location was amazing, what a wonderful start to our stay. Having 2 pugs and not wanting to board them we wanted a holiday for the entire family, Windermere and Bownesss was a delight and extremely dog friendly. All shops/cafes/bars allowed dogs within with several areas having dog bowls outside. We have already booked for Xmas and next summer and can't wait for a wonderful time away. The lodge is situated in an excellent spot with superb views overlooking the lake. Site well kept, great food in the boat house excellent helpful friendly staff. Great weekend had by all. We had a great time with the very best views of the lake. The lodge was modern and well appointed with a very welcome hot tub. The weather could have been better but as we were well prepared it did not spoil the holiday. Lots in the surrounding areas and our dog loved the walks. Location of the lodge and the entire site. Travel across the Passes as the scenery is excellent. Thank you for the lovely comments, Graham. We were so pleased to hear you all had a great time and glad you made good use of the hot tub. It is a stunning lodge to stay in – beautifully designed and tastefully decorated, luxury accommodation with magnificent views of Lake Windermere. Whether using as a base to explore the Lake District or as holiday retreat to relax and unwind, it is the perfect place to stay. We look forward to you returning for another visit in the near future. Well deserved break after being flooded . Views and being able to sit in lounge and see the out onto the lake . The lodge has everything needed for a relaxing stay, the views are amazing and the location was perfect for walking to Windermere and Ambleside (35 minute walk to either). The walk to and around Windermere was lovely. The lodge itself was lovely, lovely location, right on the water.Lovely inside and the decking area was nice. Received a phone call the week before to wish us a nice break etc which was nice.The lady who rang me was really nice and answered some questions I had. Made us feel like we were welcome that she did this. This poor welcome from the staff onsite got my back up before the holiday even started. Rest of the holiday was fab, great location, nice and clean park. Would come back but would book through someone other than the park due to nightmare we had on arrival. South Lakes Animal Park if you have kids. Thank you for your review, Jane. Although the welcome from the Park Reception team was not as expected, we were delighted to hear you enjoyed your stay at Lakeshore Lodge. You booked through us as an independent agent (and not White Cross Bay as you state) and Reception Services are provided by the park staff themselves. We were disappointed to read you comments and can only apologise that you were made to feel unwelcome. As we have no control over this service, we have passed on your comments to the Park Manager for his reference. It was good to see that all other aspects of your stay were rated as 5 out of 5. Lakeshore Lodge is a very popular, top specification lodge with stunning views of the lake and complete with it's own private hot tub for total relaxation. Absolutely great weekend spent here, gorgeous lodge in a amazing setting on lake Windermere. Hot tub was an added bonus too. Cleanliness of the park and lodge was excellent. So central to visiting various places. Can't wait to come back again for another weekend. Perfect setting for a catch up with friends. Hot tub was added bonus the views were outstanding. Canon had everything we needed. Shame about the weather. We stayed here for our honeymoon break the day after getting married on Sunday1st May. We couldn't have asked for a better place to stay, the location was beautiful the lodge was clean and well furbished, for two adults and a 10 month old it was ideal. Hot Tub was a great touch and being to the back of the lodge gave that sense of privacy. Would go back without a second thought, a bigger welcome pack maybe better, giving idea and maybe a map with key areas which are recommended to visit. I arranged for flowers and chocolates and bottle of champagne on arrival for my other half, the flowers we had to leave behind as they where still blossoming, couldn't have asked for more and really appreciate it the time taken. the view was amazing, the park was great overall good. The Boat trips in bowness, exploring the lakes, and white moss walks. Congratulations to you both! Very kind of you to take the time to review your stay, Anthony. We are delighted you had such an enjoyable honeymoon and very pleased we could help in arranging a lovely surprise for your wife on arrival. Your helpful comments are duly noted – thank you for these. Lakeshore Lodge is one of our most luxurious, stunning inside with magnificent views of the lake and a hot tub – The perfect getaway. Thank you for your lovely comments and we are so glad you had such a great time on what is a very memorable holiday. We look forward to having you as our guest again in the near future. This is our 2nd stay at lakeshore lodge and as ever the accommodation is 1st class with an absolutely stunning view over lake windemere which constantly changes. We love everything about this lodge and having a hot tub is a bonus. If I wanted to be picky the kitchen could be better stocked with pots to cook in but it's perfectly functional as it is. Loved every minute even in the rain. Lodge is lovely and clean. Amazing view out the lounge window across the lake. The hot tub is amazing even in the rain as there was a big umbrella to put over it. Overall an amazing and we'll needed break we will be returning. Had a lovely break in a fantastic location.Views from balcony are what the lakes are about.The only negative i would say is that there is too much seating in the living part and makes the space feel smaller than it is. As for comments on the parking we took 2 large cars and had no problems parking them at side of lodge. Hot tub was a real plus and main reason along with the views we booked this lodge and it didn't disappoint even in the rain. I have been twice to this lodge once with my sisters and recently with my friends a great spot for being out of the busy parts of the Lake District but still close enough to enjoy both. the location was just right for getting out and about and walking and the lovely view of lake. I would recommend using local buses to get around instead of car. This lodge is perfect for a relaxing few days' away. The view from the sitting room is just perfect. The lodge has all mod cons and the beds are the most comfortable we've ever known on a holiday. The hot tub is divine, we used it every day. Only one or two gripes - the parking is much too tight and the gate fasteners very difficult to open/close. The view and the hot tub. The drive to Keswick is breathtakingly beautiful - and the town itself is lovely. We stayed at the Lakeshore lodge for 3 nights (4 adults and 2 children). The lodge was fantastic, spotlessly clean and in a fantastic location. The beds were comfortable, showers had good water pressure and everything we needed was pretty much provided for. We all loved the hot tub and being able to sit out on the decking overlooking the marina was fantastic. In terms of the facilities on site, we never used the pool etc whilst on our stay, but have on previous visits and never had any issues. We did however go to the boathouse bar and restaurant and wished we hadn't. The staff, whilst not rude, where not particularly welcoming and clearly didn't want to be there. And the food was terrible, cheap frozen food just thrown into a deep fat fryer, none of the party were happy and couldn't wait to leave. This said do not let the facilities on site put you off the lodge, there are plenty of other places to go for food and drink and the lodge is excellent, we will definitely all be back. Lots of walks and enjoyable days out in the surrounding areas. What's a little rain in the lakes?! A beautiful lodge, kitted out with everything you need.... More glasses than the local pub!! Fantastic views over lake. Car parking tight although did manage to park two cars. A great site for children of all ages. Second time staying here. I don't think if we visit again, which is an almost certainty, that we will ever consider staying anywhere else. Beautifully clean lodge in an out of this world location. Only problem being is, it gets booked up really quickly. We were absolutely delighted to hear you enjoyed your latest stay at Lakeshore Lodge. Thank you for writing a review for us. As you point out the lodge is extremely popular and does book well in advance because of it's fantastic location with lovely lake views (oh and the hot tub of course!). We look forward to welcoming you back for a 3rd visit very soon. Came to Windermere with 2 dogs, my partner, brother and his partner. Excellent and lovely place. if you want somewhere for views and plenty to do with your doggies then this is the place to go. Where we stayed was pony view on a park in windermere. We could see a gorgeous view from the window and the lodge was in immaculate condition. The hot tub water was a little dirty but thats not really an issue. Thank you for writing a review of your recent stay at Lakeshore Lodge and delighted to hear everyone had a great time there. Apologies that you felt the water in the hot tub wasn't quite as it should be. It is checked before all stays and conforms to industry standards. Lakeshore Lodge enjoys a wonderful location within White Cross Bay and has lovely lake views. Excellent Lodge in an excellent location. Views over the lake are spectacular. Lodge is immaculately presented and very clean. Beds are the most comfortable in all holiday accommodation, normally your first nights sleep is poor but not here. Hot Tub on the decking with views over the lake. Tree top trail at the Windermere Visitor Centre is excellent. We stayed here for 4 nights in lakeshore lodge which has the best views of any lodge we have ever stayed at. Very clean, modern, and with comfortable beds. We really enjoyed using the hot tub at the end of the day to chill out with a cocktail. The only very small negative was the car parking space between the two lodges was very tight to get into if you have a large car such as we did a large 4x4. I would highly recommend a visit to this lodge if coming to white cross bay. Stunning cabin located on the edge of Lake Windermere. Beautifully presented and more than lived up to our expectations. Perfect for weekend escapes to the country with stunning views and more than just an air of tranquility. Would highly recommend this cabin. We had a very enjoyable stay at Lakeshore Lodge, weather was lovely. Location of the lodge is great, we loved waking up to the gorgeous view every morning. Hot tube was great. Bed sooo comfy! Will be back to this lodge for sure. The home from home feel the lodge had. Made for a very relaxing time. On arrival we had broken glass on the decking but as soon as we reported this it was rectified. The lodge facilities were very good, the location was perfect. The view and hot tub! Hire a motor boat from Windermere £24 for family of 4. We keep going back, I think that says it all. To our family it is our home from home we have stayed many times. The week before Easter the weather was particularly bad and waking up the following morning the wind had smashed the glass top on the outside table to pieces, called the emergency number which was answered straight away and the problem was sorted out swiftly. Spacious and clean with everything you need for your stay ... We'll just about, for some reason this stay there were no egg cups? We improvised with foil and still managed to make my daughter boiled eggs and soldiers. We went to Kirkstone Pass up the narrow roads through beautiful scenery, enjoyed walking and then lunch in the hanted pub. It was my first stay in lake district, couldnt ask for a better place to stay.. Very nice cosy lodge with a great view of windermere lake.. Despite the rainy and windy weather , we enjoyed the hot tub.. We had a memorable stay.. Thank you for reviewing your stay at Lakeshore Lodge. We were sorry the maintenance issue to which you refer wasn't resolved. The supply of gas for the outside patio heater was not included in the cost of your stay although we arranged for a 3rd party to supply this. It was only after your stay that we found out this hadn't happened. We apologise for any inconvenience this caused. That aside we are pleased you enjoyed your stay in the lodge with it's lovely location next to the lake. Our midweek stay at Lakeshore lodge turned out to be an excellecnt break. The lodge was as described, with a good view of lake Windermere. We loved a dip in the site pool and warming up in the sauna and steam rooms. We will be booking this lodge again in the future. Sitting in the hot tub with an outside temperature of -1C. Sipping a nice glass of Prosecco and strawberries. No one experiance stands out. The whole week was so enjoyable. Delighted to hear you enjoyed your stay at Lakeshore Lodge and thank you for completing a review for us. We are pleased you rated all aspects of your stay as 5 out of 5. Many guests love relaxing in the hot tub on a cold, crisp night and it definitely adds to the experince of a stay in this lovely lodge. Thank you for reviewing your stay at Lakeshore Lodge, Laurie. Really pleased you enjoyed a quiet and peaceful break at this lovely location. No matter what time of year you visit the views from the lodge are lovely and of course there is the hot tub to relax in. The lodge is in a beautiful location looking out over the lake, it is immaculately clean. We had a great week there and the hot tub was a great way to end a long day. A lovely lodge with gorgeous lake views. We went for my birthday and really enjoyed the hot tub to relax in after eating in lovely restaurantes near by. Very clean with essentials provided. Would definitely like to return and will recommend to friends. Having seen the virtual tour of the lodge we knew what to expect. Everything was in pristine condition with the hot tub being our favourite feature. To provide even greater comfort for guests, a couple of side tables would be handy to place drinks when sitting on the sofa. A torch would also be useful. I would strongly recommend making mention of the access to the lodge as we had 2 elderly guests in our party with restricted mobility and they struggled terribly to climb the 8 steep stairs which we hadn't expected. As the parking was also extremely tight for 2 large cars, this was also a downside for us as again it made access in and out difficult. We always pay more to stay in high quality accommodation and we were impressed by the standard and condition of the furniture - it really is a lovely lodge in a superb spot located so conveniently between Bowness and Ambleside . The rooms were somewhat smaller than other places we have stayed in but this isn't a deal breaker. Providing guests do not have mobility issues, I would recommend this lodge for those who want to be in the heart of the lakes within easy reach of attractions. The clubhouse was also very nice with well priced drinks and lovely food. Thank you for reviewing your stay at Lakeshore Lodge. We have noted your feedback about how some improvements can be made and we will pass these on to the owners. Similarly we have put more information on our website about the suitability of lodges for those with restricted mobility/elderly/disabilities. Thank you for bringing this to our attention. Pleased you liked the lodge, it's position and quality of furniture. Many items missing that makes a comfortable self catering holiday.examples/ towel rail only works when central heating on, various cooking items none existence , small tables in the lounge required, pedal bin missing in on suite, etc ect. Only shop at booths, don't use camp shop. Thank you for the feedback following your recent stay at Lakeshore Lodge, Barry. We were sorry to hear you felt the lodge was poorly equipped which is at odds with every other review we have received. That said and following our separate correspondence we will check and address any areas which may be lacking and we thank you for bringing these things to our attention. The lodge was amazing and really felt like a home away from home. It's location next to lake Windermere was a nice touch and it has all the facilities you need and not to mention the lovely hot tub, highly reccomend. Pleased to hear you enjoyed your 'minimoon' at Lakeshore Lodge, Jade. Thank you for taking time to complete a review for us. lakeshore lodge is something special it has stunning views of lake windermere and is in a quiet location in white Cross Bay. the lodge itself is well equipped and spacious. All 3 bedrooms have tvs in them and very comfortable beds.the deck in area is very spacious and well equipped for watching beautiful sunsets. We would definitely stay in the lodge in the future. We booked for a Monday to Friday break (wish we'd booked a full week) and were very impressed with the lodge. It was exactly as stated on the web site, very clean with very good facilities both inside, and outside on the large balcony. The lodge is situated for a perfect view over the lake, and as we had lovely weather we were able to enjoy looking at this while sitting out eating breakfast on a morning. As well as this, the site itself is beautiful and we even managed to come face to face with a deer on a walk through the woods! We also took a small dinghy with us and enjoyed a couple of hours out on the lake. We would definately return here and with a grandchild on the way there will probably be an extra person to enjoy this wonderful place! We really enjoyed a day out in Grassmere. What can we say other than 'Thank You' for a very kind review of your stay at Lakeshore Lodge. You summed up the experience of staying in this lovely lodge with lake views perfectly! Just had a fantastic stay at lakeshore lodge. The location is perfect. We loved having our meals sat on the decking overlooking the lake. Hot tub was fab and the lodge itself is very modern and clean. We will definitely be returning. We are delighted to hear you enjoyed your recent stay at Lakeshore Lodge, Paul and gave all aspects of your stay a 5 out of 5 rating. Thank you so much for your review. Beautiful lodge in an excellent location by the shore of Windermere. Very nicely furnished and very comfortable. Fab hot tub and decking. Thank you so much for your very kind review. Really pleased to hear you enjoyed your stay at Lakeshore Lodge. The lodge enjoys a much sought after location with lovely lake views with the added bonus of a private hot tub! Lodge was beautiful with everything you could possibly need, cooking accessories etc. Lovely location with fantastic views of lake & not on a busy walk way so more private than others we have stayed in. Only downside was that the hot tub had obviously just been refilled so was not at temperature until following day & the parasol was broken , unable to fold away so could have been a hinderance if we had young children. Sure that will be sorted ASAP though. The boat house is good with swimming pool well managed & reception staff very helpful. Food is good too. Thank you for the review of your recent stay at Lakeshore Lodge and pleased to hear you enjoyed your stay. Thank you for pointing out a couple of things - the broken parasol has now been replaced. The hot tub is maintained to industry standards which means the water needs replacing regularly so it isn't always at full operating temperature when guests arrive. Lakeshore Lodge does have a fantastic views of the lake and is much sought by guests wanting a luxury stay at the popular White Cross Bay Resort. Stunning lodge in a perfect location. Peaceful and tranquil. We all had a wonderful time and didn't want to leave. The lodge was equipped with everything we needed and was very luxurious with quality fittings. Hot tub was excellent and we were surprised that it was hot and ready to go when we arrived. A young deer stood and watched my husband and son through the fence on the way up to the clubhouse. Magical. We hope to return very soon. Food in the Boat House was very nice and reasonably priced. We were really pleased to hear you had a great stay at Lakeshore lodge. Thank you so much for your 5 out 5 rating for all aspects of your stay. As you say, the lodge is very luxurious and with a location right by the lake (and with it's own hot tub) it is much sought after. We would love you to return again very soon. Lovely log cabin but it needed a deeper clean, there was dog hairs in the bedding and on the sofa, the back of the cushions were covered as was the rug, we did have to hoover up thoroughly ourselves because I am allergic to animal hair and it would've caused an allergic reaction. The patio area was lovely as was the hot tub but the glass panels around were filthy with green moss or whatever it was. The boiler broke and needed re setting at least twice a day, leaving no hot water, once unfortunately while I was in the shower. The electric went off once while tea was cooking. Luckily my husband knew what to do to fix it. Apart from these negative points the kids loved it, we had a great week. Thank you for your review and feedback on your stay at Lakeshore Lodge, Sarah. We were sorry to hear some things weren't quite for you and apologise for any inconvenience caused. It is very unusual for there to be any cleaning issues at Lakeshore but we have brought this to the attention of the housekeeping contractors to ensure something similar doesn't happen in the future. It is unusual in our experience as we We also checked out the maintenance issues mentioned immediately after your stay and found everything to be in working order. Despite these couple of things we were pleased you had a great week and your children loved their stay. Having 2 small dogs we find it difficult to find nice places to stay. most caravans, lodges, cottages all seem to think just because you have dogs you enjoy living in bad and dirty conditions for your holidays. I thought that the specification of the lodge was excellent and they had thought of everything to make our stay one to remember. Relaxing in the hot tub after a day out was just what we needed. Thoroughly enjoyed it and we will certainly let our friends know and we will go back again. The combination of the quality White Cross Bay site, the property itself and it's superb lakeside location put this lodge in the absolute top 5% of holiday homes I have ever seen or experienced. If you don't mind up to 45 minutes walk you are ideally placed to walk to Ambleside, Windermere & Bowness so once the car is parked it doesn't really need to go anywhere which really makes the break more special. The hot tub was brilliant and got lots of use even when it was cool due to the weather conditions - the only thing missing was a BBQ which is a very small issue. The White Cross Bay facilities are excellent with spacious club house offering snacks with a separate restaurant and beer garden, whilst not best site shop i've ever seen (which is probably Holgates) it has all the essentials one could need. Overall this is a brilliant location for a short or long Lake District break. The lodge and location was absolutely fab, the lodge had everything to make it home from home all the decoration and essentials bedding towels were top spec would recommend this particular lodge to anyone, the sunset over the lake on an evening was lovely to watch, the hot tub was heavenly after a long day out walking. All in all the best of the best we think. We were absolutely delighted to hear that you enjoyed your stay at Lakeshore Lodge and thank you so much for your review. The 'best of the best' sums things up perfectly and thank you for letting us have a picture of the sunset. The location is rather special! That you for your 5 star rating Adele. We were sorry to hear your stay was curtailed by illness and we hope you have made a full recovery. Thanks for pointing out the issue you had with an Ambulance getting to you. We have updated our information if guests do experience a similar emergency in the future and passed on your comments to the park owners themselves. Would love you to visit again and we will email you with a special additional discount because you were unable to complete your stay. Thank you so much for reviewing your stay at Lakeshore Lodge, Lisa. We were really pleased that you enjoyed your latest stay in the Lakes. Lakeshore is a much sought after lodge because of it's amazing location and stunning views.